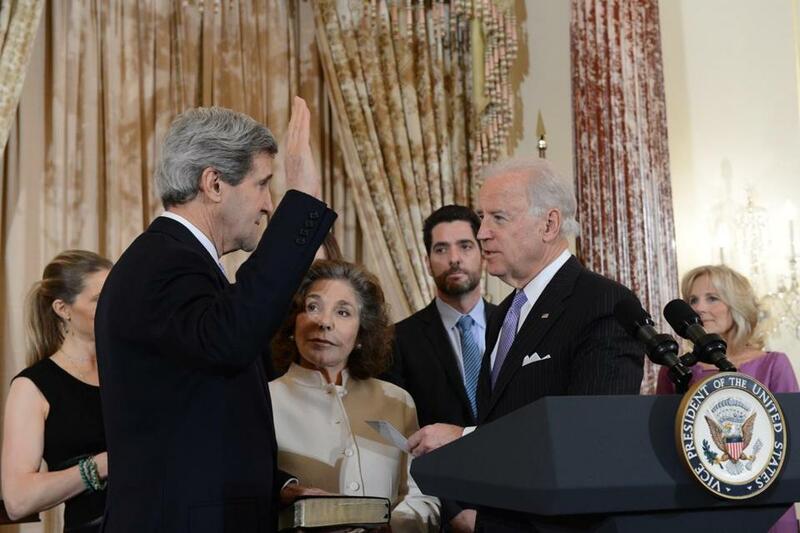 John Kerry is sworn in as secretary of state in 2013 by Vice President Biden. Let’s be honest. Few rush to read a memoir by a secretary of state. James A. Baker III, Alexander Haig, and Hillary Rodham Clinton all wrote dutiful, worthy volumes, but at best journalists and scholars picked through rather than savored them. The estimable “A Muskie Memoir’’ is not the reflections of Edmund but instead an evocative account of the near-perfect 1967 season of the Lakeland College Muskies football team of Sheboygan, Wisc. It probably was, however, read with more avidity than Dean Acheson’s “Present at the Creation,’’ the best known of the genre and remembered mostly for its title, often appropriated by writers looking for a felicitous phrase to appropriate. So let’s stipulate that John F. Kerry is up against the odds with “Every Day is Extra.’’ It weighs in at around 600 pages and is, by any measure, weighty. It has lengthy accounts of the negotiations for the Iran nuclear treaty and the Paris climate-change pact. There’s a lot about Pakistan. Also about Syria, God help us. But in truth there is much to commend Kerry’s memoir. In these pages Kerry shows remarkable honesty, depth, even spirituality. I wasn’t prepared for this, though I have known Kerry at a reporter’s arms length for more than a third of a century — and once spent an awkward, agonizing Washington evening listening to him struggle over broiled haddock about whether to vote to support George W. Bush’s Iraq war. I left the Pennsylvania Avenue restaurant without the slightest idea of how he would vote, a sentiment I believe he shared. It turns out that those kinds of struggles — over Vietnam, his first marriage, whether to run for Congress, whom to select as his 2004 running mate, whether to trust the imams — comprise a leitmotif. Born to privilege, educated at St. Paul’s School (where Robert Mueller was a classmate) and Yale, exposed to leisure at a family vacation home in Brittany, Kerry could have spent a lifetime as a white-shoe lawyer and a regular at his country club’s cocktail hour. Instead he went to war, and then went to war against the war, and then went to war in the battle to redefine liberalism in the age of Reagan. Sure, there was self interest and, on occasion, outsized interest in himself. Mostly he sailed his own course, sometimes against the wind. Much of this story is well-known to Globe readers who can still recall Kerry’s time as a senator and as Michael Dukakis’s lieutenant governor. But readers of this volume will be struck by the ironies embedded in Kerry’s life, and in that of our country in this period. He first came to national attention by protesting in the early 1970s the views of the president, a position he would seek in a close contest against Bush. He brought those protests to Capitol Hill, where he would serve for 28 years. He would deliver perhaps the most poignant speech against the war — with perhaps the most haunting question of the Vietnam era: “How do you ask a man to be the last man to die for a mistake?’’ — in the chamber of the Senate Foreign Relations Committee, where, 38 years later, he would sit as chairman. There are, moreover, charming moments, especially his recollections of the old Senate, with drinks always on offer, cigar smoke in the cloakroom air, raw stories on his baronial colleagues’ lips, even — hard to believe today — moderates in the Republican Party. The only thing that doesn’t ring quite true are the repeated accounts of his chummy relationship with Senator Edward M. Kennedy. Almost certainly Kerry remembers it that way, and surely there are shards of truth. But the most vivid memory of my decade as the Globe’s Washington bureau chief was of Kennedy’s staff constantly calling to ridicule Kerry and of the junior senator straining to be heard above the irresistible din of EMK. Still, Kerry displays remarkable honesty. He speaks with refreshing forthrightness about faith and friendships, including his with Senator John McCain, the former Hanoi Hilton prisoner of war: “What John didn’t and couldn’t know then was how difficult the journey to being against the war was for so many of us,’’ he wrote. “I joined the military for most of the same reasons he did.’’ There is remarkable poignancy — not the usual currency of the career politician and the country’s top diplomat — in that passage, and elsewhere.